WOW… I’m humbled; honoured even. A million and one, thanks goes out to Aly for this nomination. My apologies too for not responding to it sooner. 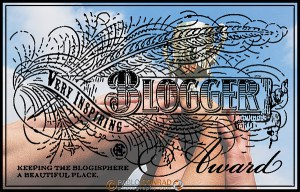 Another award to add to my wordpress belt. When I started this blog, I was a forum for me to vent my frustrations, feelings and even get a little bit of advice. So far I haven’t gotten much in terms of advice, but has been an privilege to entertain you all with my posts. The blog story can be found here. Anyways back to the award and the nomination. As usual with all WordPress awards, to accept the nomination / award, there are rules to follow. This has no exception. If I have to compile list of 7 facts about me; let’s make it 7 Random facts..
I’m a Sri Lankan living in Dubai. My favourite movie trilogy is Back To The Future. Work as a Public Relations Officer. I have 2 brothers and a sister. Currently I also have 5 cats, a dog, 2 pigeons, 7 finches & a hamster. I watched the 1st transformers team 6 times in the theatres. @julx’s thanks again for the nomination! I will post my list asap… sorry for late response.